Working with Australian medical practitioners who generously volunteer their time and skill and in-country specialist surgeons and staff, Vision Beyond AUS funds and supports free eye surgery at established local hospitals and independent rural clinics committed to providing free care for those living below the poverty line. 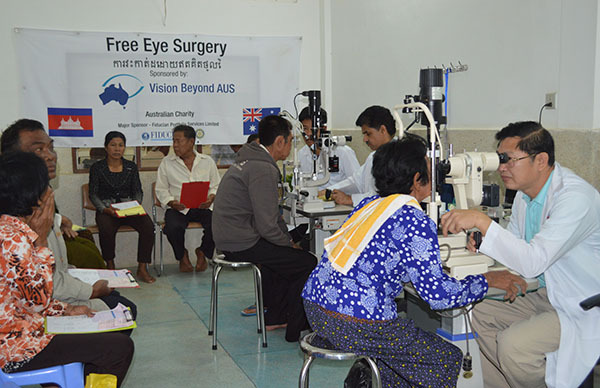 Vision Beyond AUS provides surgical and post-operative consumables and any necessary medical/surgical equipment, and undertakes local facility refurbishment, to enhance their capacity to effectively treat the needy in their community. All the money Vision Beyond AUS is able to raise goes directly to saving someone’s sight and changing their lives forever. Vision Beyond AUS still covers the costs of sending a few dedicated Australian medical personnel and technicians to these regions, because they are determined to continue this valuable work. However, in most cases surgeons will pay their travel costs, knowing that every penny raised should go to saving sight. They donate their skill, care and time, as they report that they are actually the ones who return home having had a life-changing experience, not the patients whose sight they restore and who can live again. Every hospital and clinic proudly displays the banner for VBA featuring the Rotary International Wheel, the Australian flag and the flag of the host country. All VBA has to do is raise these banners, saying that a free clinic is to be held, and the patients appear. Within days there are scores of needy people waiting to be seen by the surgeons, to be assessed for surgery or eye care. In most cases the poor find their way to the clinic, but in some areas medical personnel head out in buses to the remote villages, assess the patients’ needs there, and then bring the patients who can be cured back to the clinic for the surgery. In three hospitals in India the patients from these remote villages are offered a place to sleep for the night and food, and leave the Vision Beyond AUS clinic able to see and start their lives anew. They cannot believe that they receive all this for free and they know it is all being funded by the generosity of Australians. 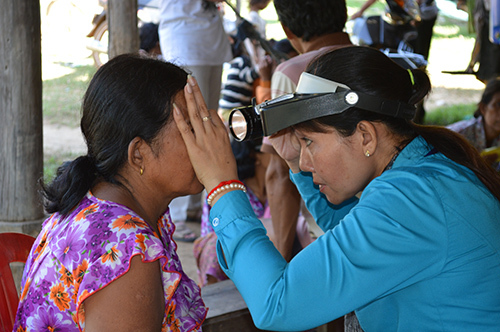 Our commitment is to provide free eye surgery and associated medical treatment to restore the sight of the world’s most disadvantaged and desperate men, women and children. We believe that our work gives these people a reason to want to live, hope for a better, healthier life and an opportunity to contribute to their community. Our work now extends to the screening and provision of glasses or surgical treatment to schoolchildren in disadvantaged rural areas. It is all part of our commitment to delivering hope, the opportunity for education, and giving these children a better chance in life, despite the fact that they might have been born into poverty. Relieve sickness and distress through the provision of medical assistance and by undertaking relief and sustainable development programs for people in Declared Developing Countries without favouritism or discrimination by race, religion, culture or political persuasion. Assist education of people in Declared Developing Countries for them to contribute to relief and sustainable development of their communities. Raise public awareness in Australia of the need to support these people who are in need of humanitarian aid, medical support, educational assistance and sustainable development. Support projects and activities of other charitable organisations.